This menorah sculpture is the product of many years of exploration into 2D to 3D digital design processes. It is an ultra-modern interpretation of the classic Hanukkah menorah form. All of the arms of the menorah branch from the same sheet of metal, just like the Jewish people share a common origin. The bronze edition of the Hanukkah menorah is a limited edition of 100 and was created exclusively for the Jewish Museum NYC. 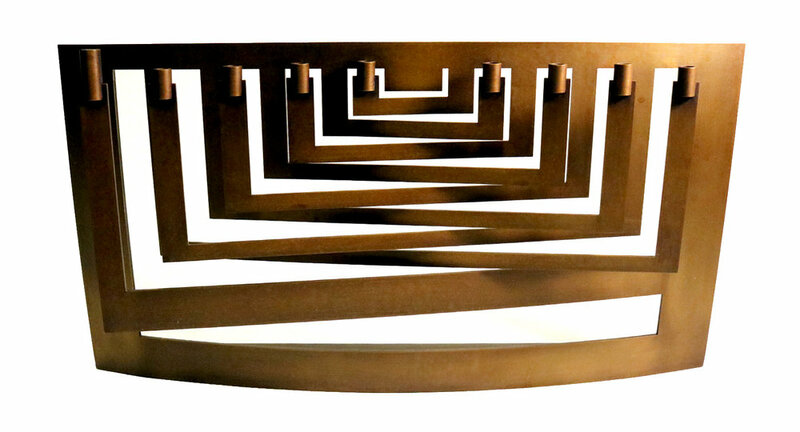 The material choice of bronze adds a timeless quality to this ultra-modern menorah form. It is made from the highest quality sculptural bronze alloy, “silicon bronze”, and is hand finished and polished to achieve the desired patina. This is a unique sculptural addition to any home and is also functional for its intended ritual use. Handcrafted and finished in Milwaukee, Wisconsin, USA. This Passover Seder Tray is designed to be a contemporary heirloom piece that can be be used year round for food service or as a display piece for the home. This Seder Tray is a reconceptualization of the traditional seder plate used during the Jewish holiday of Passover. Made from a single sheet of bronze, the modern form of the Seder Tray echoes the parting of the seas - the central miracle in the Passover story. The stainless steel dishes can be passed around the table in order to distribute the displayed foods.